Germany, at the present day able to boast so many earnest apostles of humanitarianism, until the nineteenth century was some was advanced, had contributed very little, definitely, to the literature of Humane Dietetics. A Haller or a Hufeland, indeed had, with more or less boldness, raised the banner of partial revolt from orthodox medicine and orthodox living, but their heterodoxy was rather hygienic than humane. In the history of humanitarianism in Germany the honour of the first place, in order of time, belongs to the author of Pflanzenkost, die Grundlage einer Neuen Weltanschauung, and of Mandaras' Wanderungen, whose life, political as well as literary, was one of continuous combat on behalf of justice, freedom, and true progress. Gustav von Struve was born at München (Munich), October 11, 1805, from whence his father, who was residing there as Russian Minister, shortly afterwards moved to Stuttgart. The foundation of his education was laid in the gymnasium of that capital, where he remained until his twelfth year. From 1817 to 1822 he was a scholar in the Lyceum in Karlsruhe. Having finished his preparatory studies in those schools, he proceeded to the University of Göttingen, which after a course of nearly two years, he exchanged for Heidelberg. Four years of arduous study enabled him to pass his first examination, and, as the result of his brilliant attainments and success, he received the appointment of Attaché to the Bundestag Embassy at Oldeberg. With such an opening, a splendid career in the service of courts and kings seemed to be reserved for him. His family connexions, his great abilities, and his unusual acquirements at so early an age guaranteed to him quick promotion, with reward and worldly honour. But to figure in the service of the oppressors of the people - to waste in luxurious trifling the resources of a peasantry, supplied by them only at the cost of a life-time of painful destitution - such was not the career which could stimulate the ambition of Struve. The conviction that this was not his proper destiny grew stronger in him, and he soon abandoned his diplomatic position and Oldenberg at the same time. Without wealth or friends, at variance with his relatives, who could not appreciate his higher aims, he settled himself in Göttingen (1831), and in the following year in Jena. His attempts to obtain fixed employment as professor or teacher, or as editor of a newspaper, long proved unsuccessful, for independent and honest thought, never anywhere greatly in esteem at that time in Germany was in especial disfavour with all who, directly or indirectly, were under court influences. Yet the three years which he lived in Göttingen and Jena supplied him with varied and useful experiences. Struve's active political life began in 1845. In that year were published Briefwechsel zwischen einen ehemeligen und einen jetzigen Diplomaten ("Correspondence between an Old and a Modern Diplomatist"), which was soon followed by his Oefftliches Recht des Deutschen Bundes ("Public Rights of the German Federation") and his Kritische Geschichte des Allgemeinen Staats-Rechts ("Critical History of the Common Law of Nations"). In the same year he undertook the editorship of the Mannheimer Journal, in which he boldly fought the battles of political and social reform. He was several times condemned to imprisonment, as well as to payment of fines; but undeterred by such persecution, the champion of the oppressed succeeded in worsting most of his powerful enemies. 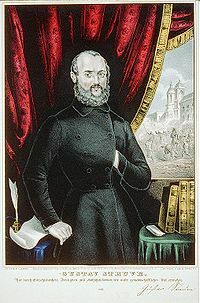 In the beginning of 1847 he founded a weekly periodical, the Deutscher Zuschauer ("The German Spectator"), in which, without actually adopting the invidious names, he maintained in their fullest extent the principles of Freedom and Fraternity; and it was chiefly by the efforts of Struve that the great popular demonstration at Oldenberg of September 12, 1847, took place, which formulated what was afterwards known as the "Demands of the People." The public meeting, assembled at the same town March 9, 1848, which was attended by 25,000 persons, and which, without committing itself to the adoption of the term "republican," yet proclaimed the inherent Rights of the People, was also mainly the work of the indefatigable Struve. He took part, too, in the opening of the Parliament at Frankfurt. His principal production at this time was Grundzüge der Staats-Wischenschaft ("Outlines of Political Science"). This book, inspired by the movement for freedom which was then agitating, but, as it proved, for the most part ineffectually, a large part of Europe, is not without significance in the education of the community for higher political conceptions. Struve and F. Hecker took a leading part in the democratic movements in Baden. These attempts failing, after a short residence in Paris , he settled near Basel (Basle). There he published his Grundrechte des Deutschen Volkes ("Fundamental Rights of the German People"), and, in association with Heinzenm, a Plan für Revolutionizung und Republikanizung Deutschlands. The earnest and noble convictions apparent in all the writing of the author, and the unmistakable purity of his aims, forced from the more candid of the opponents of his political creed recognition and respect. Nevertheless, he narrowly escaped legal assassination and the fusillades of the Kriegsgericht or Military Tribunal. "The thoughts and feelings which the food we partake of provokes are not remarked in common life, but they, nevertheless, have their significance. A man who daily sees Cows and Calves slaughtered, or who kills them himself, Hogs 'stuck.' Hens plucked, or Geese roasted alive, &c., cannot possibly retain any true feeling for the sufferings of his own species. He becomes hardened to them by witnessing the struggles of other animals as they are being driven by the butcher, the groans of the dying Ox, or the screams of the bleeding Hog, with indifference. . . Nay, he may come even to find a devilish pleasure in seeing beings tortured and killed, or in actually slaughtering them himself. . . . The last period of his life was passed in Wien (Vienna), and in that city his beneficently-active career closed in August, 1870. His last broken words to his wife, some hours before his end, were, "I must leave the world . . this war . . this conflict!" With the life of Gustav Struve was extinguished that of one of the noblest soldiers of the Cross of Humanity. His memory will always be held in high honour wherever justice, philanthropy, and humane feeling are in esteem. In Mandaras' Wanderungen, of a different inspiration from that of ordinary fiction, and which is full of refinement of thought and feeling, are vividly represented the repugnance of a cultivated Hindu when brought, for the first time, into contact with the barbarisms of European civilisation. To few of our English readers it is presumable, is this charming story known; and an outline of its principal incidents will not be superogatory here. "While still on board ship I had been startled when I saw the rest of the passengers feeding on the flesh of animals. 'By what right,' I asked them, 'do you kill other animals to feed upon their flesh?' They could not answer, but they continued to eat their salted flesh as much as ever. For my part, I would have rather died than have eaten a piece of it. But now it is far worse. I can pass through no street in which there are not poor slaughtered animals, hung up either entire or cut into pieces. Every moment I hear the cries of agony and of alarm of the victims whom they are driving to the slaughter-house, - see their struggles against the murderous knife of the butcher. Ever and again I ask of one or other of the men who surround me, by what right they kill them and devour their flesh; but if I receive an answer, it is returned in phrases which mean nothing or in repulsive laughter." "From you, ladies, doubtless I shall meet with approval. Tell me, could you, with your own hands, kill to-day a gentle Lamb, a soft Dove, with whom perhaps you yesterday were playing? You answer - No? You dare not say you could. If you were to say yes, you would, indeed, betray a hard heart. But why could you not? Why did it cause you anguish, when you saw a defenceless animal driven to slaughter? Because you felt, in your inmost soul, that it is wrong, that it is unjust to kill a defenceless and innocent being! With quite other feelings would you look on the death of a Tiger that attacks men, than on that of a Lamb who has done harm to no one. To the one action attaches, naturally, justice; to the other, injustice. Follow the inner promptings of your heart, - no longer sanction the slaughter of innocent beings by feeding on their bodies (beförden Sie nicht deren Tödtung dadurch dass Sie ihr Fleisch essen)." "Assuredly it will not repent you to have formed this resolution. The man who, with firmly-grounded habits, denies himself something which lies in his power, to spare pain and death to living and sentient beings, must become milder and more loving. The man who steels himself against the feeling of compassion for the lower animals will be more or less hard towards his own species ; while he who shrinks from giving pain to other beings, will so much the more shrink from inflicting it upon his fellow-men." "It seemed to him, on the contrary, that it is the bodily frame of man that especially declares against flesh-eating. The Tiger, the Lion, in short, all flesh-eating animals. seized their prey, running, swimming, or flying, and tore it in pieces with their teeth or talons, devouring it there and then upon the spot. Man cannot catch other animals in this way, or tear them in pieces, and devour them as they are. . . . Besides he had higher, and not merely animal, impulses. The latter lead him to gluttony, intemperance, and many other vices. Providence has given him reason to prove what is right and what is wrong. The doctor however, in place of admitting this argument, grew all the warmer. 'In all Nature,' said he, 'one sees how the lower existence is serviceable to the higher. As man does, so do other animals seize upon the weaker, and the weakest upon plants, &c.,' "
To this the Hindu philosopher in vain replies, that the sphere of man is wider, and ought therefore to be higher than that of other animals, for the larger the circle in which a being can freely move, the greater is the possible degree of perfection; that, if we are to place ourselves on the plane of the carnivore in one point, why not in all, and recognise also treachery, fierceness, and murder in general, as proper to man? that the different character of the Tiger, the Hyæna, the Wolf on the one side, and of the Elephant, the Camel, the Horse on the other, instruct us as to the mighty influence of food upon the disposition, and certainly not to the advantage of the flesh-eaters; that man is to strive not after the lower but the higher character, &c., &c. To this the hostess replies : "This may be all very beautiful and good, but how is the housekeeper to be so skilful as to provide for all her guests, if she is to withhold from them flesh dishes?" "Exactly as our housekeepers do in the Himalayan valley - exactly as our hostess does to-day," rejoins Mandaras. He allege many other arguments, and in particular the high degree of reasoning faculty, and even of moral feeling exhibited by the miserable slaves of human tyranny. Various are the objections raised, which, it is needless to say, are successfully overthrown by the champion of Innocence,a nd the company disperse after a prolonged discussion. The second division of the story takes us to the Valley of Suty, the Himalayan home of Mandaras, and introduces us to his amiable family. A young German, travelling in that region, chances to meet with the father of Urwasi (Mandaras's betrothed), whom he finds bowed down with grief for the double loss of his daughter, who had pined away in the protracted absence of her lover and succumbed to the sickness of hope deferred, and of his destined son-in-law, who, upon his return to claim his mistress, had fallen (as it appeared) into a death-swoon at the shock of the terrible news awaiting him. The old man conducts the stranger to the scene of mourning, where Damajanti, the sister of Mandaras, with her friend Sunanda, is engaged in weaving garlands of flowers to deck the bier of her beloved brother. An interesting conversation follows between the European stranger and the Hindu ladies, who are worthy representatives of their countrywomen, Sakuntalà. (3) Accidentally they discover that he is a flesh-eater. Sunanada: Is it possible that you really belong to those men who think it lawful to kill other beings to feed upon their bleeding limbs? Theobald: In my country it is the ordinary custom. Do you not, in your country, use such food? Damajanti: Can you ask? Have not other animals feeling? Do they not enjoy their existence? Theobald: Certainly; but they are not so much below us, that there can be no reciprocity of duties between us. Damajanti: The higher we stand in relation to other animals, the more are we bound to disregard none of the eternal laws of Morality, and, in particular, that of Love. Hateful as it is, at all events, to inflict pain upon an innocent being capable of feeling pain. Or do you consider it permissible to strike a dog, to witness the trembling of his limbs, and to hear his cries? Theobald: By no means. I hold, also, that it is wrong to torture them, because we ought to feel no pleasure in the sufferings of other animals. Damajanti: We ought to feel no pleasure! That is very odd reasoning. Detestation - disgust, rather, is the sensation we ought to have. Where this sentiment is real, there can be no desire to profit by the sufferings of others. Yet, where the feelings of disgust for what is bad are weaker than inclination to the self-indulgence which it promises, there is no possibility of their triumphing. For gain the butcher slaughters the victim; for horrible luxury other men participate in this murder, while they devour the pieces of flesh, in which, a few moments before, the blood was still flowing, the nerves yet quivering, the life still breathing! Theobald: I admit it : but all this is new to me. From childhood upwards I have been accustomed to see animals driven to the slaughter-house. It gave me no pleasure : rather it was a positively displeasing spectacle; but I did not think about it - whether we have the right to slaughter for food, because I had never heard doubt expressed on the matter. Sunanada: Ah! Now I can well believe that the men in your country must be hard and cold. Every softer feeling must be hardened, every tenderer one be dulled in the daily scenes of murder which they have before their eyes, by the blood which they shed daily, which they taste daily. Happy I am that I live far from your world. A thousand times would I rather endure death than live in so horrible a land. Damajanti: To me, too, residence in such a land would be torture. Yet, were I a man, had I the power of eloquence, I would go from village to village, from town to town, and vehemently denounce such horrors. I should think that I had achieved more than the founders of all religions, if I should succeed in inspiring men with sympathy for their fellow-beings. What is religious belief, if it tolerates this murder, or rather sanctions it? What is all Belief without love? And what is a Love that excludes from its embrace the infinitely larger part of living beings? Sweet and fair indeed is it to live in a valley which harbours only mild and loving people; but it is greater, and worthier of the high destiny of human life, to battle amongst the Bad for Goodness, to contend for the Light amongst the prisoners of Darkness, What is Life without Doing? We women, indeed, cannot, and dare not ourselves venture forth into the wild surge of rough and coarse men; but it is our business at least to incite to all that is True, Beautiful, and Good; to have regard for no man who is not ardent for what is noble, to accept none of them who does not come before us adorned with the ornament of worthy actions (der nicht mit dem Schmucke würdigen Thaten vor uns tritt). This eloquent discourse takes place while the three friends are watching, during the night, at the bier of the supposed dead. At the moment when the last funeral rites are to be performed, equally with the spectators we are surprised and pleased at the unexpected resuscitation of Mandaras, who, it appeared, had been in a trance, from which at the critical moment he awoke. With what transports he is welcomed back from the confines of the shadow-land, may easily be divined. For some time they live together in uninterrupted happiness; the young German, who had adopted their simple mode of living, remaining with them. In the intervals of pleasing labours in the field and the garden, they pass their hours of recreation in refined intellectual discourse and speculation, the younger ones deriving instruction from the experienced wisdom of the venerable sage. The conversation often turns upon the relations between the human and non-human races; and, in the course of one of his philosophical prelections, the old man, with profound insight, declares that "so long as other animals continue to be excluded from the circle of Moral Existence, in which Rights and Duties are recognised, so long is there no step forward in Morality to be expected. So long as men continue to support their lives upon bodies essentially like their own, without misgiving and without remorse, so long will they be fast bound by blood-stained fetters (mit blutgetränkten Fesseln) to the lower planes of existence." "Every step from a lower condition to a higher is bound up with certain difficulties. This is especially the case when it is a question of shaking off habits strengthened by numbers and length of time. Had the human race, however, not the power to do so, then the step from Paganism to Christianity, from predatory life to tillage, in particular from savage barbarousness to a certain stage in civilisation, would have been impossible. All these steps brought many struggles in their train, which to many thousands produced some hardships (Schaden) ; to untold millions, however, incalculable benefits.So, also, the steps onward from the Flesh-Diet cannot be established without some disturbances. The great majority of men hold fast to old prejudices. They struggle, not seldom with senseless rage, against enlightenment and reason, and a century often passes away before a new idea has forced the way for the spread of new blessings. "Therefore, we need not wonder if we, also, who protest and stand out against the evils of Flesh-Eating, and proclaim the advantages of the Vegetable Diet, find violent opponents. The gain which would accrue to the whole race of man by the acceptance of that diet is, however, so great and so evidently destined, that our final victory is certain. . . .
"They tell children, perhaps, that they must not be cruel either to 'Animals' or to human beings weaker than themselves. But when the child goes into the kitchen, he sees Pigeons, Hens, and Geese slaughtered and plucked; when he goes into the streets, he sees animals hung up with bodies besmeared with blood, feet cut off, and heads twisted back. If the child proceeds still further, he comes upon the slaughter-house, in which harmless and useful beings of all kinds are being slaughtered or strangled. We shall not here dwell upon all the barbarisms bound up in the butchery of animals; but in the same degree in which men abuse their superior powers, in regard to other species, do they usually cause their tyranny to be felt by weaker human beings in their power. "What avails all the fine talk about morality, in contrast with acts of barbarism and immorality presented to them on all sides? "It is no proof of an exalted morality when a man acts justly towards a person stronger than himself, who can injure him. He alone acts justly who fulfils his obligatory duties (Verpflichtungen) in regard to the weaker. . . . He, who has no human persons under him, at least can strike his horse, barbarously drive his calf, and cudgel his dog. The relations of men to the inferior species are so full of significance, and exercise so mighty an influence upon the development of human character, that Morality wants a wider province that shall embrace those beings within it. "The monstrous evils and abuses which gradually and stealthily have invaded our daily foods and drinks, have now reached to such a pitch that they can no longer be winked at. He who desires to work for the improvement of the human body, dares not leave uncontested the general dominant unnaturalness of living. "With a people struggling for Freedom the Kitchen must be no murderous den (Mördergrube) ; the Larder no den of corruption ; the Meal no occasion for stupefaction. In despotic states the oppressors of the People may intoxicate themselves with spirituous drink, and bring disease and feebleness upon themselves with unlawful and unwholesome meats. The sooner such men perish (zu grunde gehen) the better. But in free states (or in such as are striving for Freedom), Simplicity, Temperance, Soberness must be the first principles of citizen-life. No people can be free whose individual members are still slaves to their own passions. (7) Man must first free himself from these before he can, with any success, make war upon those of his fellow-men." Weighty words coming from a student of Science of Human Life. Still weightier coming from one who had devoted so large a part of his existence to assist, and had taken so active a part in, the struggles of the people for Justice and Freedom.
. . . I più schivi alletando ha persuaso.
. . . E dall' inganno sua vita riceve. . . . . . . . . . . . . . . . . . . . . .. . . Geruslemme Liberata, I. See Pflanzenkost, die Grundlage einer Neuen Weltanschauung, Von Gustav Struve, Stuttgart, 1869. For the substance of the brief sketch of the life of Struve we are indebted to the courtesy of Herr Emil Weilshaeuser, the recently-elected President of the Vegetarian Society of Germany (Jan., 1882), himself the author of some valuable words on Reformed Dietetics. See Sakuntalà, or the Fatal Ring, of the Hindu Shakspere Kalidâsa, the most interesting production of the Hindu Poetry. It has been translated into almost every European language. Mandaras' Wanderungen. Zweite Ausgabe. Mannheim. Friedrich Götz. 1845. For a copy of this now scarce book we are indebted to the courtesy of Herr A. von Seefeld, of Hanover. Das Seelenleben; oder die Naturgeschichte des Menschen. Von Gustav Struve. Berlin : Theobald Grieben. 1869.
. . . . . . . Des Lichtes Himmelsfackel leihen !" . . . . . . . . . . . . . . . . . . . . . . . . Schiller. Das Lied von der Glocks.